Selected pages now feature opportunities to use Earth Engine, an easy to use Google-sponsored web tool, to further explore the history of the landscapes featured on these pages. 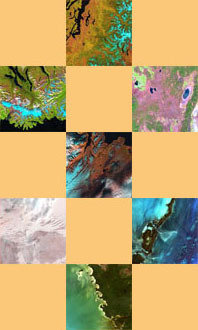 Earth Engine is a timelapse series of Landsat images gathered between 1984 and 2012, offering a nearly 30-year record of environmental change around the globe. This interactive feature enables users to take a closer look and increase their understanding of the human impact on the Earth. To access this feature, go to https://earthengine.google.org, click on the Timelapse tab, and enter a place name. (Suggested place names are offered for SceneChanges pages.) The screen will zoom to your location and present the timelapse images as a slideshow. The scene can be dragged and zoomed in or out, and the speed of the timelapse can be changed by clicking on the tag below the year (lower left). Individual years can be selected for longer viewing by clicking and holding on those hash marks, or by stopping the slide show and clicking on a hash mark.